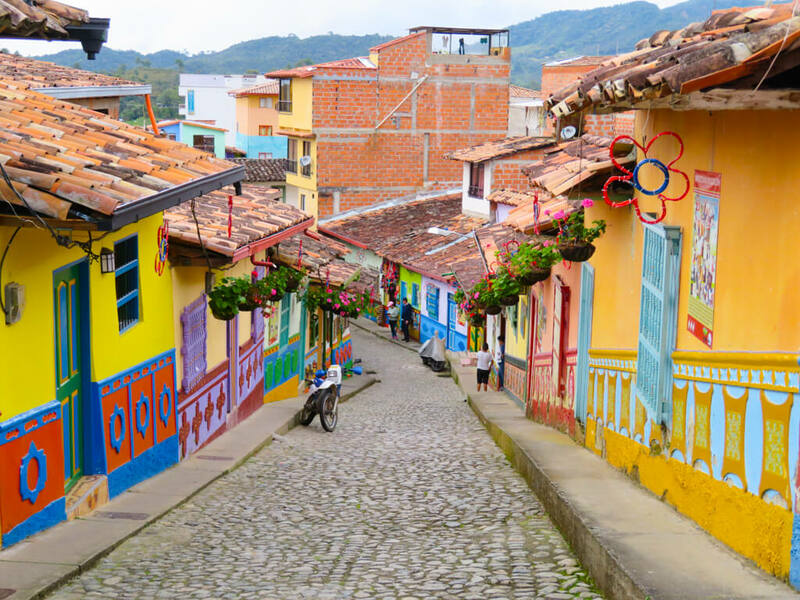 After seeing pictures of the colourful town of Guatapé on Instagram, I immediately started researching how to go there! I was eager to see Guatapé as it is considered one of the most beautiful places in Colombia. I also wanted to challenge myself and climb the steep stairs of the rock of Guatapé to see breathtaking views of the surrounding lakes and islets. I decided to take a day trip from Medellin to Guatapé. There are two main options for getting to Guatapé from Medellin: organized tour or bus. I was feeling tired after three weeks of traveling and wanted to relax a bit, so I decided to sign up for a group tour. If you don’t like tours, getting from Medellin to Guatapé is pretty simple. Go to Caribe station, which is connected to the North Bus Terminal and buy your ticket (12 000 COP one way). You can take the bus directly to Guatape or to the path that leads to the rock. You will need to walk for 20 minutes up the hill to the rock or take a tuk-tuk. Most people climb the rock first. To get to Guatape from the rock, take a short taxi or tuk-tuk ride. You should buy your return bus tickets during the afternoon so as to avoid the long lineups later in the day. The last bus back to Medellin leaves at around 6pm. I booked and paid for the tour on the Toucan Cafe website. It cost 79 000 COP. When I arrived at Parque del Poblado (the meeting point for the tour), I found out that the tour was actually operated by a company called Tours Guatapé. There were about 30 people on the tour. Most of them were young – in their twenties or thirties. We had two guides – one for the Spanish speakers and one for the English speakers. Commentary was given in Spanish first, and then in English. Since I can understand some Spanish, I noticed that the English guide left out some of the jokes the Spanish guide told. Our first stop was at a small restaurant for breakfast. Everyone received an arepa, a corn pancake with a cheese filling. It is a popular snack among Colombians and Venezuelans. However, this particular arepa was rather bland, and I saw many of the people on the tour putting salsa on their arepas. The coffee I was served at the restaurant was absolutely delicious though! I don’t usually like drinking coffee, but I absolutely loved the coffee there. It was my first time ever trying Colombian coffee, which is world-renowned for its rich taste and excellent quality. After a short visit to the town of Marinilla, where we had a walking tour and visited a church, the tour bus headed towards El Peñón de Guatapé (the Rock of Guatapé). This tall (2135m) rock is located in the town of Guatapé, but the neighbouring town of El Peñol has also laid claim to the rock. Some residents of Guatapé started painting the town’s name on the side of the rock to mark it as their own, but angry residents from El Peñol stopped them. This is why you can see a “G” and a half-formed “U” on one side of the rock! On the way to the rock, the guides collected money for the price of the ticket to climb the rock. It cost 18 000 COP per person. The guides explained where and when to meet for lunch after climbing the rock. The rock’s long, twisting stairs look very intimidating from below. There are 740 steps in total, and they are numbered every 50 steps or so for you to keep track of how much more you have to climb. The climb is certainly tiring but it is not as brutal as it looks, especially if you are young and of average fitness. I think everyone on my tour made it up except for one person. The stairwells have thick, high railings and there is enough space for you to stand and take breaks as you go up. Near the top of the rock, there is a place for you to buy drinks or snacks and sit down. For those who want to buy souvenirs, there is also a gift shop. The employees who work there have to climb all the stairs almost every day! Past the gift shop and refreshment area is the actual summit. It is a tower where you can see an amazing 360-degree view of many lakes and islands. These lakes were flooded in the 1970s for the construction of a hydroelectric dam. It is one of the biggest sources of power for Colombians. Many tourists were taking selfies in front of the view and someone was even flying a drone! The drone footage must have been incredible. After I finished admiring the view, I started climbing down the rock. There are separate staircases for going up and going down so you don’t bump into people. I met the group at the “Rock” restaurant where I was given several menu options to choose from. I ordered Bandeja Paisa, a traditional dish that came with pork, egg, beans, avocado, plantains, and rice. The portion was very filling and delicious! The juice served with the meal was also very tasty. After lunch, everyone got back on the bus and after a short ride, we arrived in the colourful town of Guatapé. We followed the guide through the streets, admiring the bright buildings, which were just as beautiful in real life as in the photos I had seen! The guide explained that the colourful square designs found on the lower half of each building are called zócalos. They represent the personality, occupation or history of the residents. I saw so many different motifs – dolphins, doves, llamas, and even the Pink Panther! After the walking tour, we took a boat tour on the lake. A few people stayed behind because they wanted more time to explore the town. To be honest, the boat ride was really boring. With the exception of a fantastic view of the rock, which doesn’t come till the end of the ride, the scenery is not very impressive. All of us had to wear lifejackets even though the boat was huge and moving at a snail’s pace. So if you skip it, you will only miss a photo opportunity of the rock. Once the ride was over, we were given some free time to explore the town. I wandered around taking photos and also bought a few souvenirs. This man in an orange shirt just happened to be standing next to the orange house! Overall, I enjoyed the tour and would recommend it! Initially, I was concerned that it would be rushed and that I wouldn’t have time to take all the photos I wanted to. I was also worried that I might be too slow climbing the rock. However, I felt there was plenty of time to explore and take photos in Guatapé as the town is pretty small. Climbing the rock also didn’t take anywhere near as long as I had expected. We weren’t rushed during lunch either and I had enough time to enjoy my meal. In total the tour lasted about 12 hours, from 7:45 to around 7:30. People were picked up and dropped off at Parque del Poblado or at Hotel Nutibara in Downtown Medellin. I can’t get over how colourful and beautiful this place is. What a great find! A love the view from the top. OMG, those lakes!!!! My friend has a pic there, and when I asked him, he just said Colombia!!! Now I know where it is thank you! I am determined to visit Colombia this year and now I have to include Guatape in my itinerary. Looks gorgeous. Do most people just go for the day from Medellin? Or is it work staying the night? Thank you! Yes, most people just do a day trip from Medellin. But if you want to stay longer, there are other activities to do in the area like biking, hiking, ziplining, kayaking, paintball and even paragliding! I didn’t visit Guatape during my time in Medellin and I am sooooo filled with regret looking at these photos! Stunning! OMG this place is BEAUTIFUL! I want to go! There’s something about colorful places that just make me so happy. I would feel like I was living in a real cartoon! Your photos capture the place beautifully! Thanks for giving me another destination to keep on my radar! Heh, it’s colourful indeed! Great backdrop for photos, I would really like to spend some time there. OMG! That’s definitely the most colorful town I’ve ever seen. So cute! I need to visit! W O W! This looks right up my street, going on the bucket list for sure, thanks for the detailed advice…. Sounds like a great day tour! I’ve been seeing lots of photos from this place on instagram too, and it’s definitely piqued my interest. I especially love the pink panther decorations! Wow, this place is so vibrant and colorful! I’ve never heard of Guatapé, Thanks for this post! I’m planning to hop on a bus and explore Guatapé. After reading this, perhaps a tour is the way to go. Was lunch included in the price of the tour? Yes, lunch was included as well as a small breakfast (coffee & arepas). Only the admission fee for climbing the rock was not included. These colours are incredible and almost don’t seem real! I have just added Guatapé to my bucket list for South America! Thanks for the awesome inspiration!